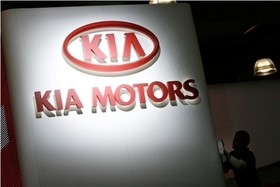 Kia Motors aims to boost output at its Slovak plant by 13 percent to 285,000 vehicles in 2012, repeating a similar rise in production, the automaker said. Production rose by 10 percent to more than 252,000 vehicles last year, while engine production increased 12 percent to more than 359,000 units, the local unit of the South Korean carmaker said. Engine production is expected to rise to more than 450,000 units in 2012. "Last year was very positive for Kia in Europe as we achieved record figures for vehicle and engine production," Eek-Hee Lee, president and CEO of Kia Motors Slovakia, said in a statement. "Our focus for 2012 is on embedding a regular three-shift operation so we can reach full plant capacity within the first quarter of the year, and then make preparations for volume production of the all-new Kia Cee'd." Kia will reveal its new Cee'd at the Geneva auto show in March. Kia Slovakia operates an assembly plant in the northern Slovak town of Zilina and is a major exporter in the euro zone country. Kia makes the Cee'd compact, Sportage medium SUV and Venga small minivan at the factory. The plant is key to Kia's plans to sell more than 500,000 vehicles in Europe, including Russia, this year. Kia Motors Slovakia's top export markets in 2011 were Russia (23 percent), the UK (10 percent), Germany (9 percent), Spain (8 percent) and France (5 percent). The Cee'd model line accounted for 41 percent of production in Zilina last year, just ahead of the Sportage at 40 percent.